The five-judge constitution bench commenced hearing on the pleas seeking a ban on candidates from contesting elections against whom charges have been framed. “Your Lordships have held that criminalisation in the Legislatures is a negation of democracy and the basic structure of the Constitution. It has been brought to the attention of the parliament that there is this ever-rising criminalisation of politics which is encroaching on the democratic structure. The Law Commission report is corroborated by the Election Commission as well as the Constitutional Reforms Committee". “The problem is that while at present 34% of the candidates carry this baggage, in another 10 years, it will go upto 45%. The Legislature is deliberately not interfering despite the insistence of the constitutional and statutory bodies. The Select Committee has advanced the presumption of innocence until proven guilty and that any measures in this behalf may be susceptible to abuse. Are the members of the Select Committee scared of their own brothers?”, he continued. He advanced that The Law Commission in its latest report has noted that winnability is a major factor with political parties. Next, Mr. Dwivedi indicated the oaths in Schedule III of the Constitution to which the ministers of the Union, candidates for election to the Parliament and judges of the Supreme Court subscribe. He showed how only the latter pledge to “uphold the Constitution”. “Article 102 (disqualification of MPs) was laid down in 50s. Since then, there have been several pointers that it has failed to serve the purpose it is intended. 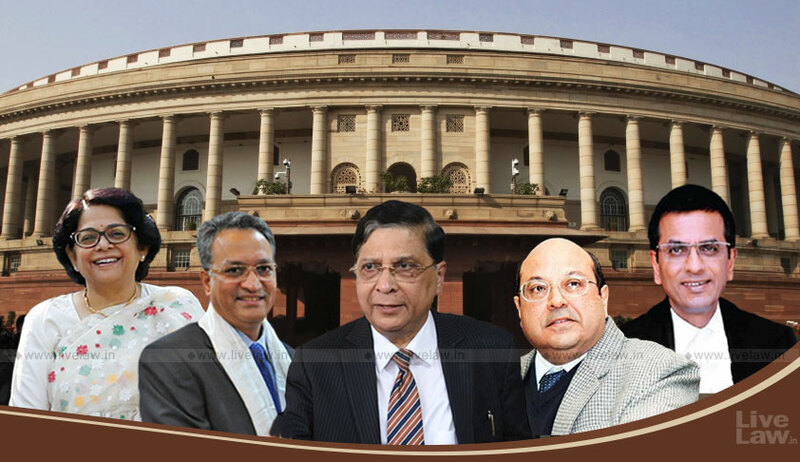 In as much as sub-clause (e) of Article 102(1) disqualifies for being chosen as or for being a MP any person who is so disqualified under any law made by the Parliament, Chief Justice Dipak Misra reflected that the law so made is the Representation of People’s Act. “A number of judgments from Jyoti Basu (1982) say that the right to elect is a statutory right. Now you want us to say it is a constitutional right flowing from Article 326...what we are dealing with is criminality of legislators and the right to vote is an indirect aspect...you are exhorting us to exhort the parliament to lay down the law that we declare? There is a traditional ‘lakshman rekha’ which cannot be crossed”, weighed in Justice Rohinton Nariman. Indicating the 2002 judgment of the apex court holding the right to be informed to be part of Article 19(1)(a), Mr. Dwivedi submitted that If there is silence of the legislature, the judges can direct the Election Commission to lay down norms for rejection of nomination papers under section 33 of the RPA. “Yes, we evolved the right to be informed and then the option of NOTA. Definitely, criminalisation does not find place in our democratic polity. But you are asking us to issue mandamus to the EC to go against the law and extend disqualification to all stages of the criminal law? Once we direct so, it will become the law. Should we go into those stages where the FIR is lodged or the chargesheet is filed or the charges are framed or should there be a law?”, pointed out the Chief Justice. “A disqualification needs to be laid down by the EC in respect of a person who is chargesheeted by court...Your Lordships have said that such person is presumed to be charged”, replied Mr. Dwivedi. “But he continues to be innocent”, added the Chief Justice. “That innocence is an aspect of criminal law. we are dealing with Fundamental Rights here”, advanced the Senior Advocate. Amicus Curiae Senior Advocate Sidhharth Luthra also indicated that the onus is on the accused, so in case of a charge, there is no presumption of innocence but a reverse burden. Justice Nariman hinted that the court may instead strengthen the offence already provided for, that special courts could be established for persons chargesheeted after filing the nomination papers and that the process between trial and judgment could be fast-tracked. “In case of a person against whom chargesheet is filed, there could be day-to-day trial and once the judgment is pronounced, he would automatically stand disqualified”, elaborated the Chief Justice. Intervening, Advocate Gopal Sankaranarayanan (appearing for Bharatiya Matdata Sangathan) asserted that the petitioners are not asking for framing of a new offence. He invited the bench to read together section 125A (penalty for filing false affidavit, prescribing imprisonment of up to 6 months or fine or both) with section 8(2) of the RPA which disqualifies for a further period of 6 years from the date of release one sentenced to imprisonment for atleast 6 months for hoarding/profiteering, adulteration of food or drugs or under the Dowry Prohibition Act. “how can section 125A fit in section 8(2)? What you are doing is expanding it and adding something that is not there”, remarked Justice Nariman. “we are not going into disqualification at all. we are saying that a man to whom Article 125A applies is different from one who is convicted for holding an office of profit”, Mr. Sankaranarayanan sought to submit. On Thursday, Attorney General K. K. Venugopal drew the attention of the bench to section 7 of the RPA providing that a MP or MLA may be not disqualified on any other ground other than those specified in the Act. Justice Nariman assured that the bench had not missed the provision. Replying in the affirmative, the AG said that being entitled to Article 21, the candidate has the right to undergo the entire gamut of trial and enter his defence. “There is nothing in the oath except allegiance to the Constitution and the law...why can he not stand by the Constitution even if he is guilty?”, advanced the AG. “We have to act as per the preliminary legislation which exists in this case. Nothing can be added”, he asserted.